UNEMPLOYMENT is a sad old business for everyone, but the unemployed critic cuts a tragicomic figure – trudging about, mumbling opinions no one wants to hear, shaking their fist at the sky. That’s how it is for me. Two months after my last radio review was published in the Sunday Tribune, I’m still shouting uselessly at the radio while subsiding back into obscurity – or at least I was until George Hook supplied me with 15 minutes of fame. For some five-and-a-half years, until the Tribune was placed in receivership in February, my weekly radio review was enjoyed by perhaps as many as a dozen readers, including my mother. In all that time, I never did learn to predict who would be thin-skinned and who wouldn’t, who could take a joke and who couldn’t. It still comes as something of a surprise to realise that the most ostentatious characters can be the ones with the tenderest little feelings. A critic has to be ornery. Even in conversation, the person who is unfailingly pleasant and reasonable is the person most likely to exasperate the whole room. It’s the same in print only moreso. If you wrote nothing but kind reviews, people would say of you: “She made many friends during her week-long career as a radio critic”. The only friends I made were from among a small number of independent documentary-makers. These are people who are waging a probably hopeless war against the prevailing belief that, unless it’s got a bombastic, self-absorbed, overpaid ‘personality’ on it, it’s not good radio, and so they deserve all the support they can get. 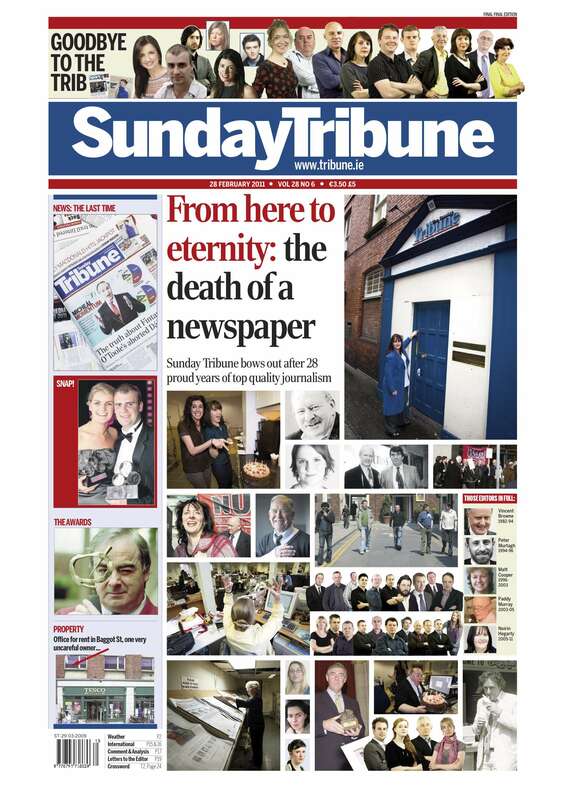 On Tuesday 1 February, I heard, ironically on RTE radio, that I was effectively out of a job: a receiver had been appointed to the Sunday Tribune. The following day, not knowing whether the paper would be published that Sunday, Olivia Doyle, arts editor and world’s best boss, asked me to file my radio review as usual. That one never saw the light of day, which was probably just as well considering the state of it. The grief over the Tribune’s demise was extremely intense. The paper was the Jack Russell terrier of the fourth estate: A big newspaper in a small newspaper’s body, it was clever, fearless, funny, tenacious, idiosyncratic, and – though one hates to speak ill of the dead – not above disgracing itself on your shoe from time to time. It also inspired in its staff the lunatic loyalty of the Jack Russell. The pay was like cheap dog food – just enough to keep your ribs from showing – and you never knew when you were going to get kicked by Independent News & Media (INM). But all its staff were fiercely protective of it, and of each other. We were a pack. In the end, of course, after some 20 years of shrill warnings about the Tribune’s imminent ruin, we were all thrown out of a car in the middle of a bog. There were weeks of union meetings, all of which necessitated costly trips to Dublin, because you need a secure line of credit to buy a train ticket in this country. There was a deafening, dispiriting silence from the board of INM. There was the news that, as a contractor, I would have to fight to get even statutory redundancy. There were the heartbreaking farewell hugs from colleagues. There was the dogged campaign against despair, despair being the serpent in the desert for the unemployed. On Friday 4 March, a week after the Tribune was officially declared dead, the editor Noirin Hegarty threw a farewell party for staff. At around half past midday that day, before leaving for the party in Dublin, I received an email from George Hook’s lawyers. Suddenly I was the party of the first part, and not at all in a party mood. The letter was shocking in several respects. Firstly, the lawyers asked me to publish an apology by way of an advertisement in “an equivalent Sunday newspaper” on 13 March. An “equivalent” Sunday newspaper, I repeated, mystified. I forwarded the letter to some of my colleagues. “An equivalent Sunday newspaper?,” they shrieked, disbelieving. “*Equivalent? *” There is no such thing. Secondly, the letter requested an offer of compensation. What would someone with two jobs and an address in Foxrock consider to be reasonable compensation, I asked myself? Would it exceed the sum I might get if I succeeded in claiming statutory redundancy from the Department of Social Protection? Thirdly, the lawyers made reference to “bone fides” [sic]. Can there really, I wondered, be such a thing as a solicitor who doesn’t know how to spell bona fides? It seems there can. I pictured a bevy of 20-something lawyers, all qualified five minutes ago, all tottering around in vertiginous heels waiting for their Ally McBeal moment to start. I sought Noirin’s advice; she consulted the managing director, the lawyer, the receiver. Everyone advised me to do nothing. That is my favourite advice even at the best of times, so I did nothing. Then there was a piece about the letter in the Phoenix on 10th March, obviously leaked by one of my Tribune friends. Then it appeared on Ireland’s funniest website, Broadsheet.ie. Then it took off on Twitter. Hook was bombarded by invective. Things were said to him that were infinitely more critical than anything I ever wrote about him. He was insulted in a manner that was even more damning – honestly – than anything I said privately about him after receiving his lawyers’ letter, and believe me I left no expletive unturned. Hook’s lawyers appeared on his behalf in the County Registrar’s Court on 28th March, making the story a straight court report suitable for the national press. Newspapers began phoning, though not, infuriatingly enough, with the intention of offering me a job. The word “devastated” – a word I would never use – was harmlessly put in my mouth. By midweek, my sense of my own importance had been spectacularly inflated. With a head this big, would I even fit through the door of the local welfare office? One elderly neighbour, apple-cheeked and twinkly, approached to offer his commiserations, and to question me kindly about what might happen next. “Out of my way, old man,” I said. “I’m too important to talk to you now.” If I kept going like that, I would soon have been eligible for my own radio show. Happily, this story is over now, and not a minute too soon. As it has turned out, Hook has taken a far worse beating than I have; that, at least, is not my fault. I would like to apologise, though, now that I have the chance. I’d like to apologise to Derek Mooney, who haunts my conscience because I was systematically, routinely horrible to him in my radio review. Not that there was ever so much as a murmur of complaint from Mooney about it. Either he was bigger than the criticism I heaped on him or – and this is every bit as likely – he never read it. It’s good advice for any over-sensitive broadcasters out there.